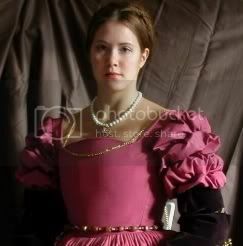 Gloves in historical dressing is an interesting field. There's been regional and cultural differences on their meaning and value, and seems to have changed meaning throughout the centuries. I came a cross a couple of passages in the book "Fashion and Fancy. 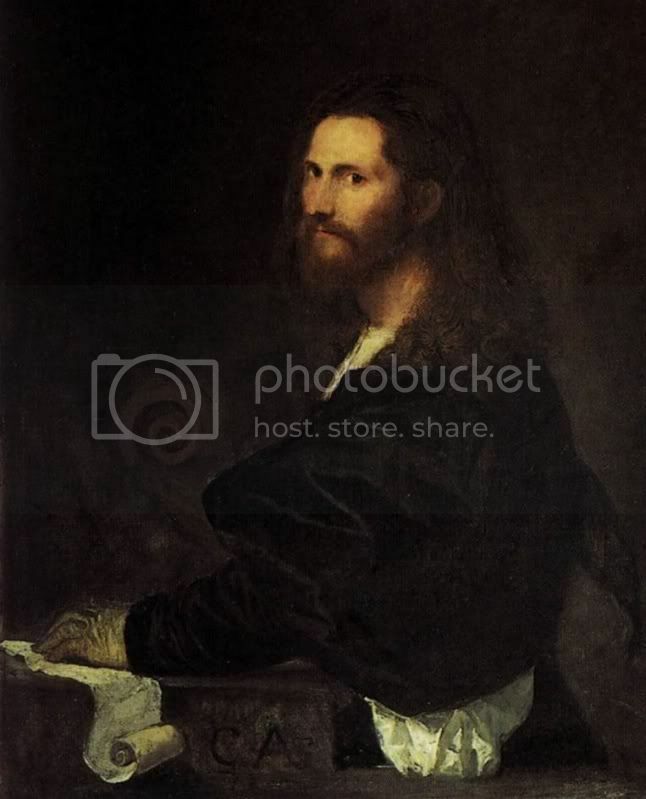 Dress and meaning in Rembrandt's paintings" which I would like to share with you. Have in mind that they comment upon gloves as displayed in public. People of course also wore them to protect the hands, just as we do today! "In mediaeval times gloves served as ritual objects in liturgy and could be a symbol of legal authority. In the age of chivalry gloves were taken up as acceptance of a challenge and served as gifts demonstrating loyalty and service to the recipient. 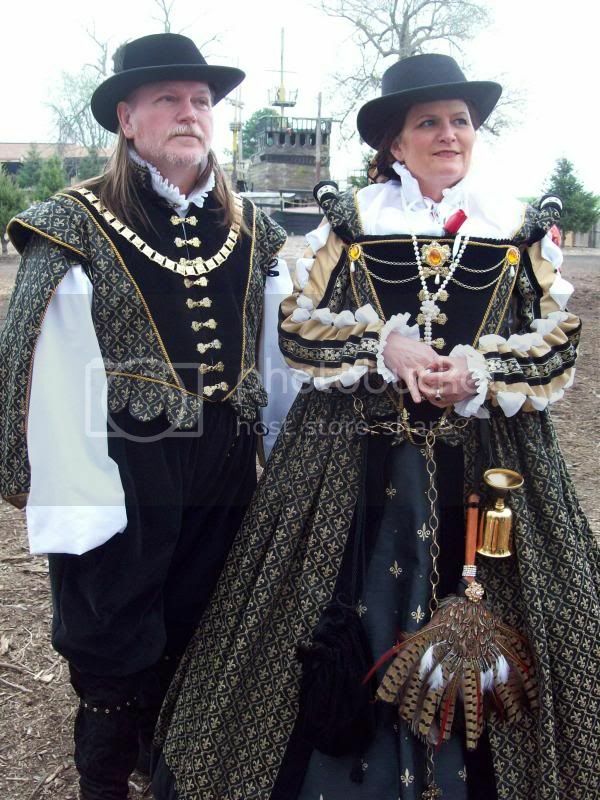 They also served as gifts to wedding guests or provided as funeral attire. 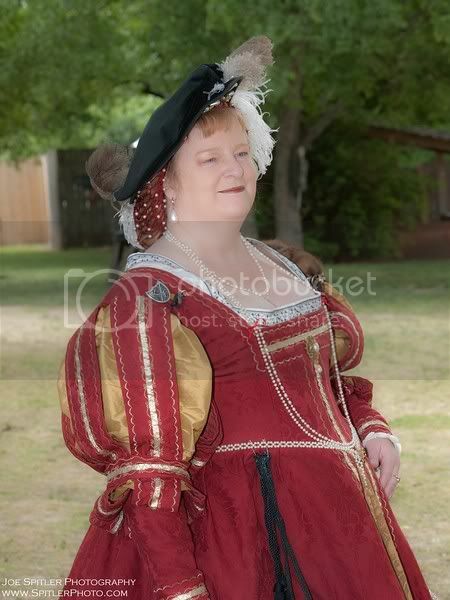 By the beginning of the seventeenth century, however, they had lost most of their former legal or liturgical significance and instead had became "just" a status symbol. Gloves, like fans and handkerchiefs, were costly as well as fashionable accessories whose primary function was to display their owners' wealth and status. The fact that these accessories were coveted luxury items was also the reason why they were popular tokens of love or gifts at weddings (...). 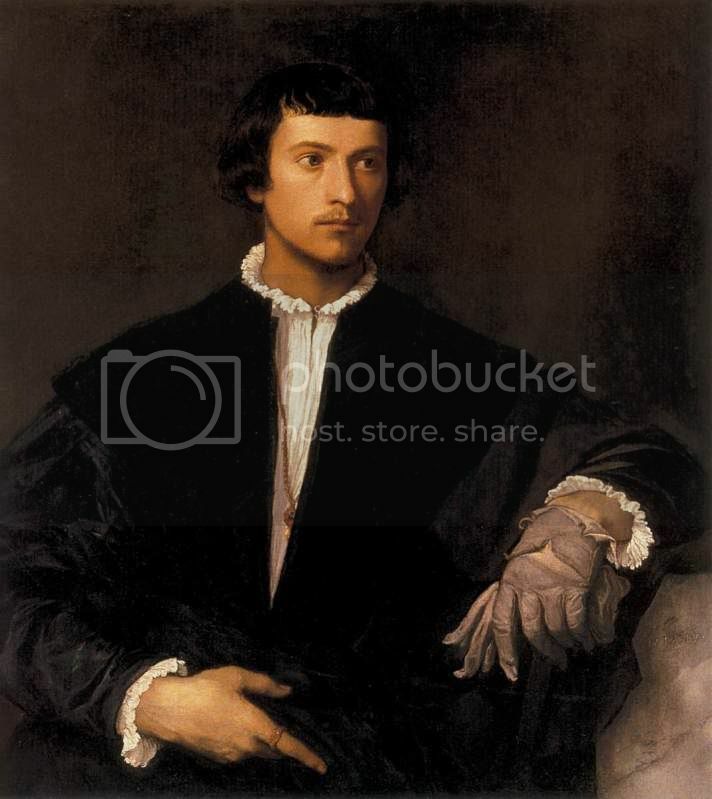 "I have decided to omit the gloves in the copy, because in my opinion such a burgher-like practice is in no way fitting for such a noble prince" (page 87). Nobility didn't stop wearing gloves in the mid 17th century, as shown in several inventory lists. There is an amazing selection of colour, embellishment and material in gloves in these lists. 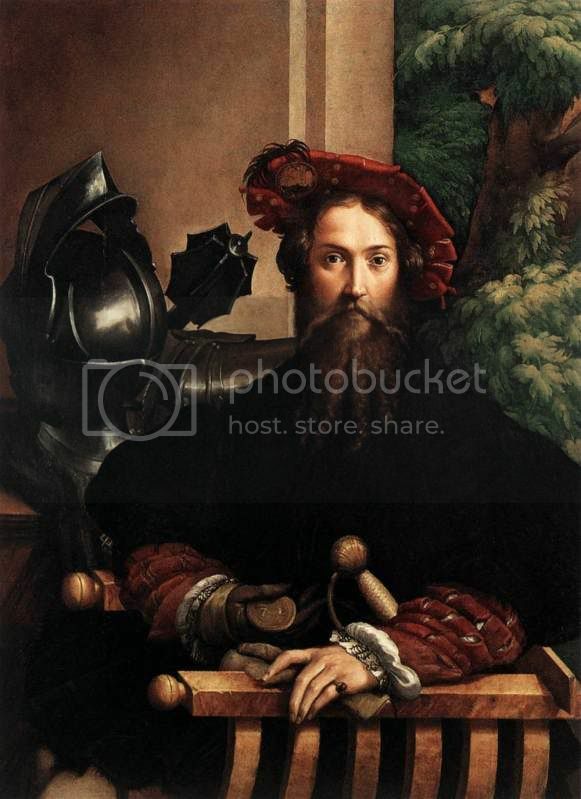 But they were no longer a status symbol, and was therefore not included in portraits. Note that this book is on Dutch fashion in particular! Not sure if the same applied for nearby England and Germany, or places like Italy or France. 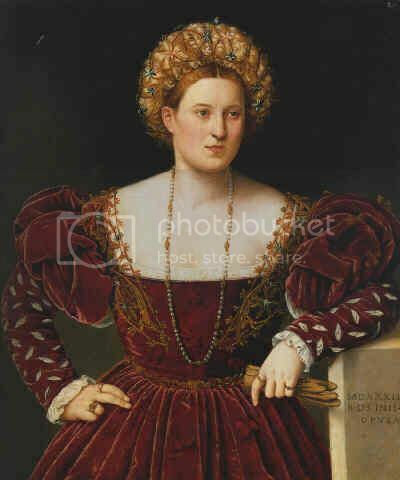 "We understand that a shipment from Spain of a great quantitu of gloves from Ocagna has arrived, of which we have need. But we want them to be of the best quality and of the type from Valencia which yellow inside and worn with the inside leather folded over. We ask you to examine them carefully and to have them examined by others, above all by someone Spanish who will understand and know their quality and how they should be made for use by women. 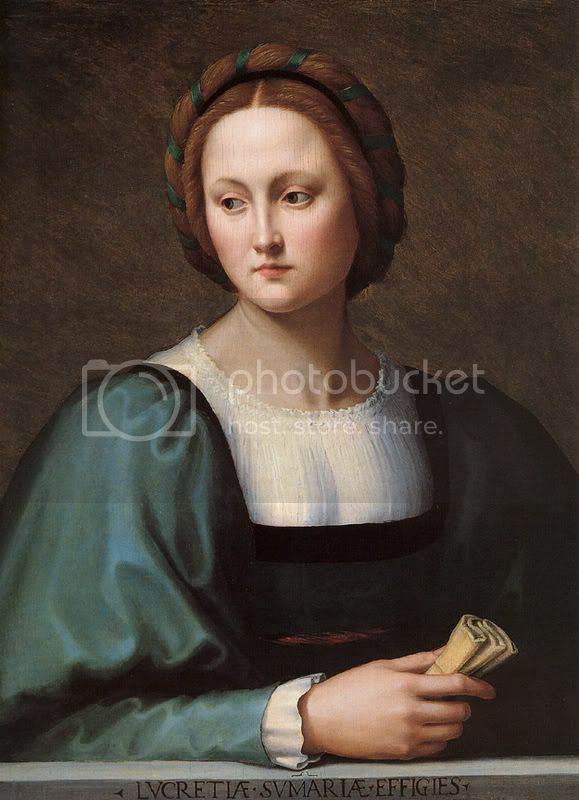 And if they are appropriate for our needs, spend two ducats on them and send them to us by the first means possible, and tell us whom we need to pay." 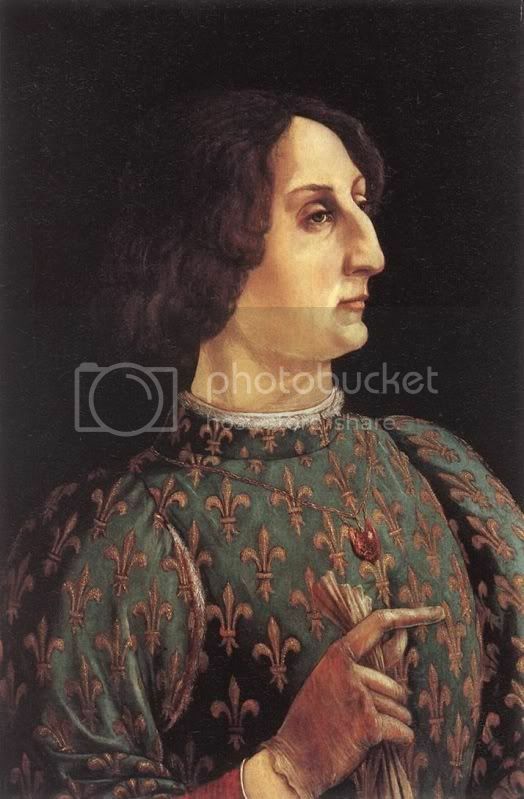 "We gave ten ducats to Sanzio to buy as many gloves of d'Ocagna for our use when he went to Spain, and being in Ferrara we spoke to him that he should serve us well. It has now been many days since his return, and since then he has sent us twelve dozens of the saddest gloves that had he searched all of Spain in order to find such poor quality I don't believe he could have found as many. 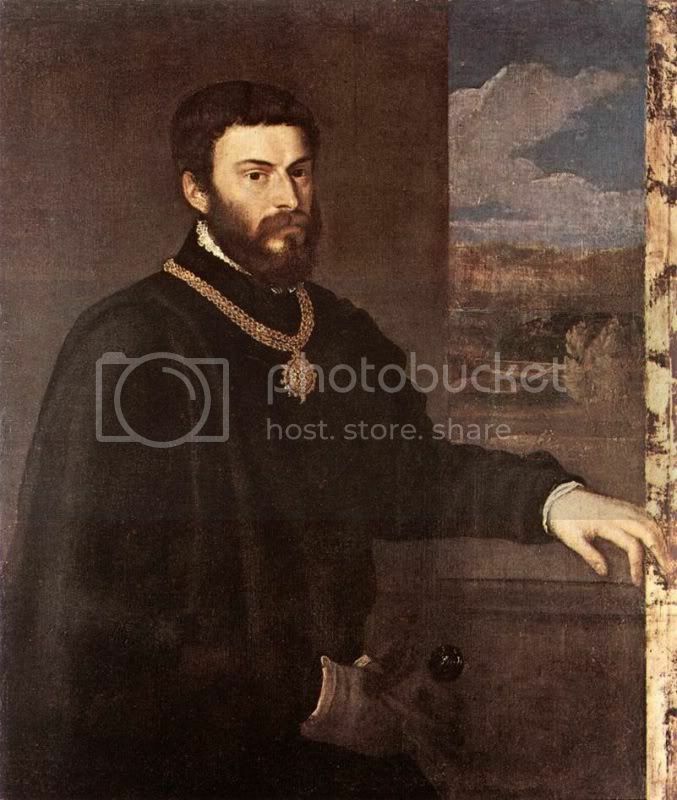 In Rome, Genoa and Florence there are better ones without comparisation and using some diligence in Ferrara itself he could have found some that were as good and perhaps even better. Therefore we have decided to return them so that you do not think that we have such little judgement in gloves that we would think that these were good enough to give to our ladies-in-waiting and to some of our friends. We would be ashamed to give them to people whom we love and they would never wear them. 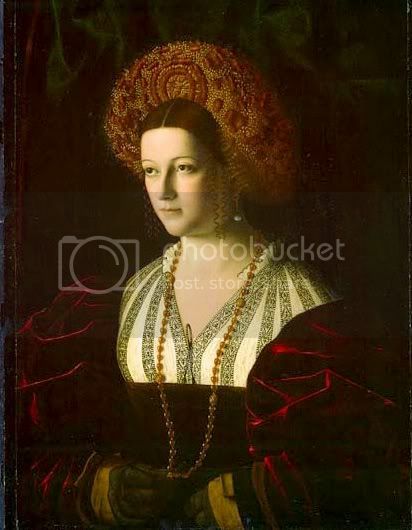 Can you please send them back and thell him how badly we have been served..."
Isabella d' Este (1474–1539) was literate and a fashionista, and her various letters are SO fun to read. A couple is included in the book I've listed underneath. That book is lots of fun in general, so if your local library carries it I highly recommend you pay them a visit! 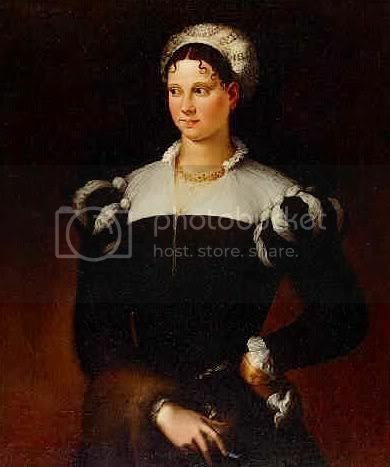 Does any of your research tell you why some portraits show the sitter holding gloves only and why some are wearing one and holding the other? Since it's done by both sexes and all ages, I don't think it tells of marriage or love, as attributes often do. It also shifts between left and right hand. My own private theory is that it emphasizes the hands - or rather, the hand without glove. 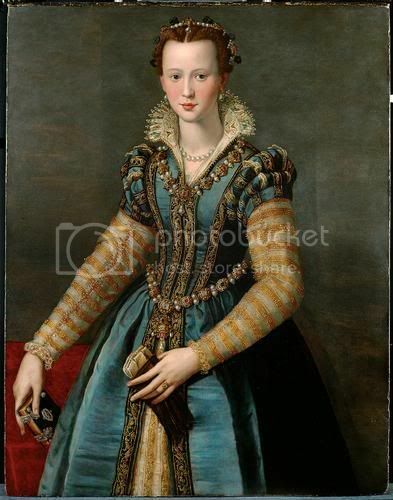 That hand is, at least in Italian 16th century portraits, placed in a specific gesture or shows off a ring. 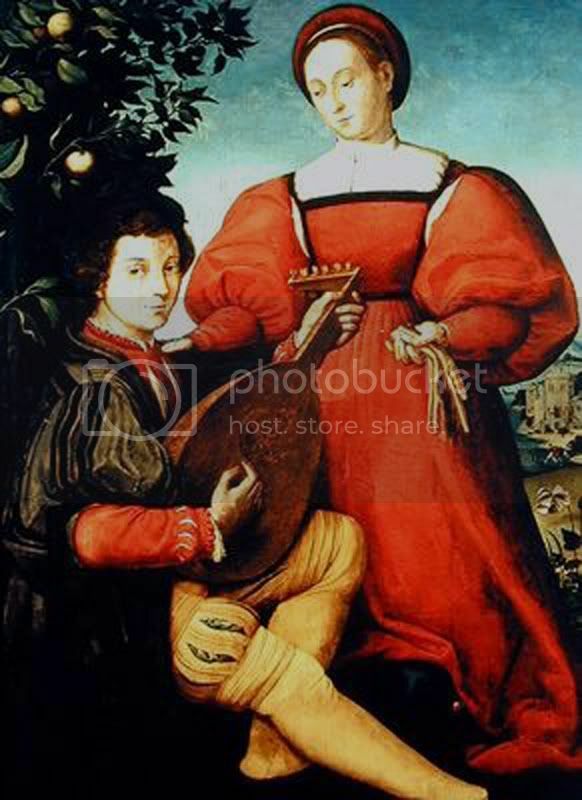 The ring might be a sign of matrimony, but it might also bear some indication of the sitter's ancestry and position. I might be wrong, though. A lofty art theory is that gloves usually comes in pair, and when you break the sense of pairing, by only wearing one glove, you remove the sense of practicality. The hands are not meant for labour. 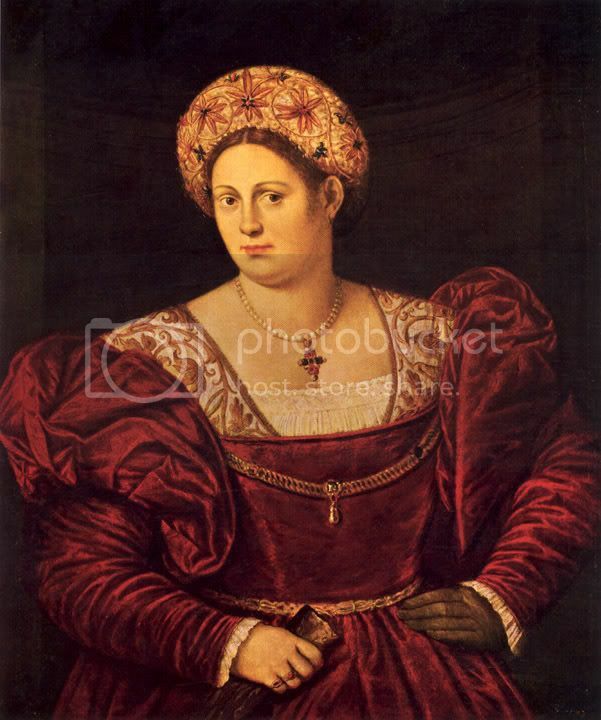 I'm not sure I readily buy that hypothesis, since wearing-one-glove-only isn't consistent in aristocracy portraits. But interesting none-the-less. The article is interesting, touching many subjects on the theme glove in the 16th and 17th century. 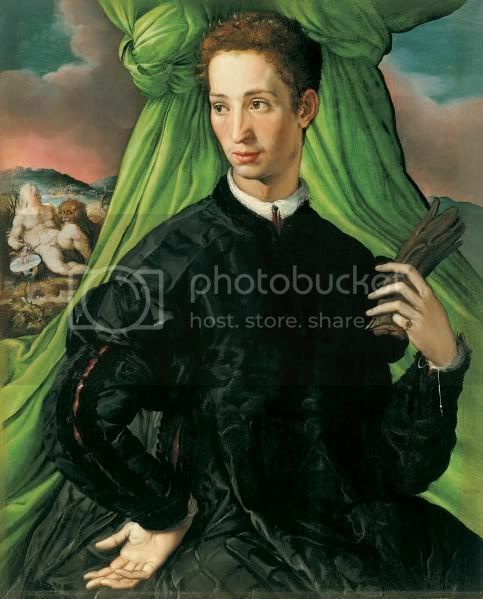 Portrait of Charles IX holding gloves. How about some real 16th century gloves? Lovely! The picture of Elizabeth's sewing bag and pincushion is gorgeous. Is her spoon in the cutlery set mother of pearl? 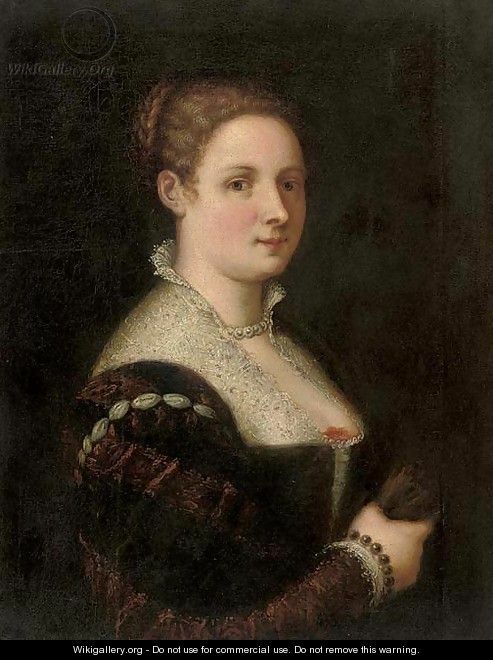 This portrait by Paolo Veronese shows a lady holding something that looks like gloves. If the lacquer wasn't so dark, you could probably see more detail. *sigh* The embellished gloves you show are gorgeous, Dona. 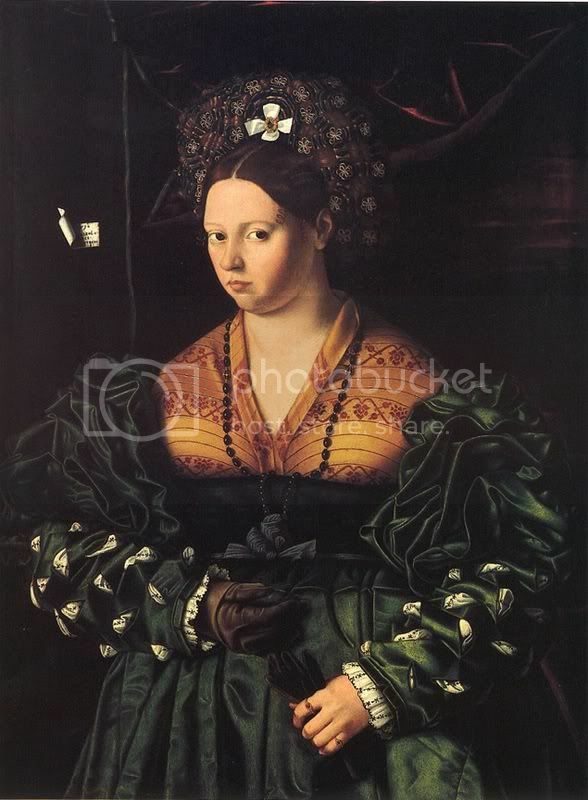 My thoughts are also that the ungloved hand could still express that which the painting intended ( power, purity, engagements) while still showing off your fab fashions with the other. I'd read also that gloves were scented with perfumes? Does anyone know if it was the fashion to wear only one glove out and about, or to carry them as one might a scented.handkerchief and not really wear them at all? I'm pretty sure that they actually wore them a lot. If your status could be determined by your lack of callouses, I can imagine that they were fanatical about protecting their hands. 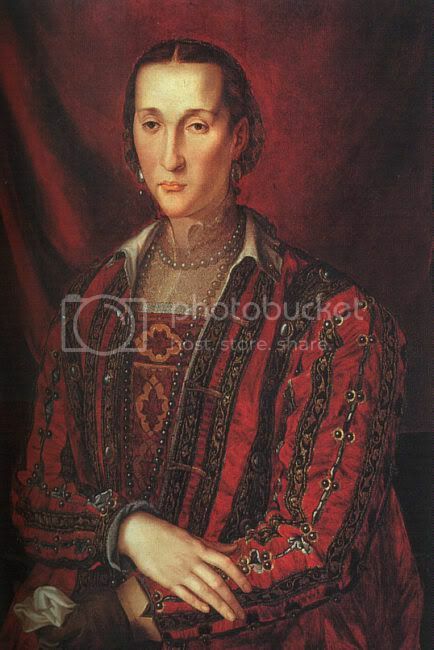 But aside from that, the Medici archives show that Eleanor de Toledo went through kid gloves by the hundreds and she did not like the ones made in Florence. How could you possible develop a callous when you are that wealthy and have servants for everything?! I want this delima in my next life. I guess you'd need them for riding, for sure, and when chilly out. #325 states the wearing of leather gloves is only allowed to Chaplain Brothers, “who are permitted to wear them in honor of Our Lord’s body, which they often hold in their hands”, and to the mason brothers (members of the Order who worked in stone and help build fortifications)…because of the great suffering they endure and so that they do not easily injure their hands; but they should not wear them when they are not working. It would appear that these gloves were to be distinguished from arming apparel and armored mittens/mufflers. Hollywood would then go about confusing folks with the use of gloves with “dominant” colors to portray positions within the Order. Here Christopher Lee portrays the Grand Master of the Templar Order in the 1997 BBC release of Ivanhoe. There's something I didn't know. Here's another link touching a bit on Warrior Monk's post and showing more beautiful examples of gloves. The link says that Elizabeth had the habit of playing with her gloves and removing and replacing them as a device to draw attention to her hands. It's also said that it was a sign of respect to remove your right glove when meeting someone of importance. These could both be reasons we see portraits with the right hand ungloved .